Maintaining trophy Catfish in our Texas waters is viable to the future of catfishing and generations to come. Our goal is to increase awareness on the dwindling numbers of trophy Catfish, as well as obtain data for ongoing research. This data is collected by anglers across the state by measuring, tagging, and submitting information to our online database. Some of our educational awareness includes seminars, and everything from speaking engagements at men’s groups to hosting children’s fishing events. Your contribution assists us greatly in conserving trophy Catfish in Texas and giving our children an opportunity to experience fishing trophy Catfish as we once knew it. 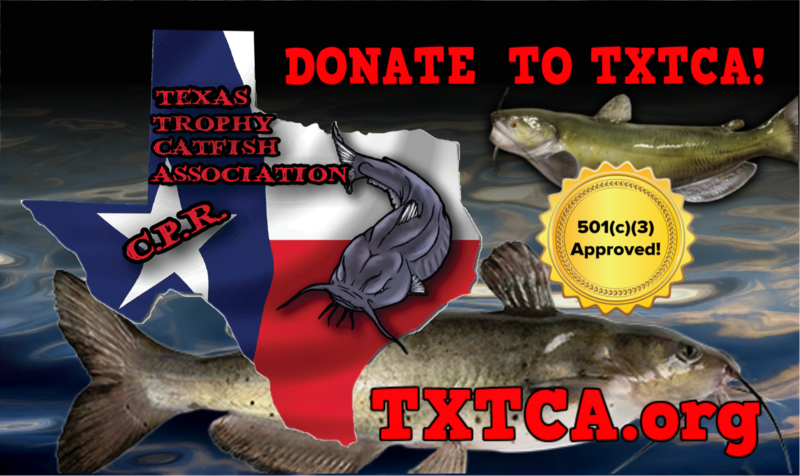 TXTCA is dedicated to the protection and research of North American Catfish species through the process of research, data collection and education of the angling and outdoors community. To provide data collection methods necessary to research and better understand the Catfish population, growth patterns, environment, and survival rate. To provide facilities, equipment and training necessary to help educate the angling and outdoors community with the intent to better protect and preserve our fishing and outdoor environments. To provide opportunities for participants and outdoor enthusiasts to engage in recreational, competitive and charity events. To sponsor, host and/or participate in events and activities that promote the sport of fishing and the conservation and protection of fisheries. To collect and provide data and research to modify current regulations for catfish fisheries. Research into the data collected by TXTCA members through tagging, performed by subject matter experts in the fields of biology and wildlife. Lower the cost of fish tagging equipment to allow for more people to get involved in the effort. Provide equipment to be used to eliminate costs for participants in “Kids Fish Fest” events. TXTCA speaking engagements at fishing seminars and training events. Attendance and representation at national fishing conventions. Sponsorship of Catfish tagging events to help teach conservation and collect fish data. Provide equipment necessary to rejuvenate and maintain marine life during educational events prior to their safe release.